Life in the fur trade era of the West was often dangerous and difficult. But it also had its moments of incredible beauty and bliss. 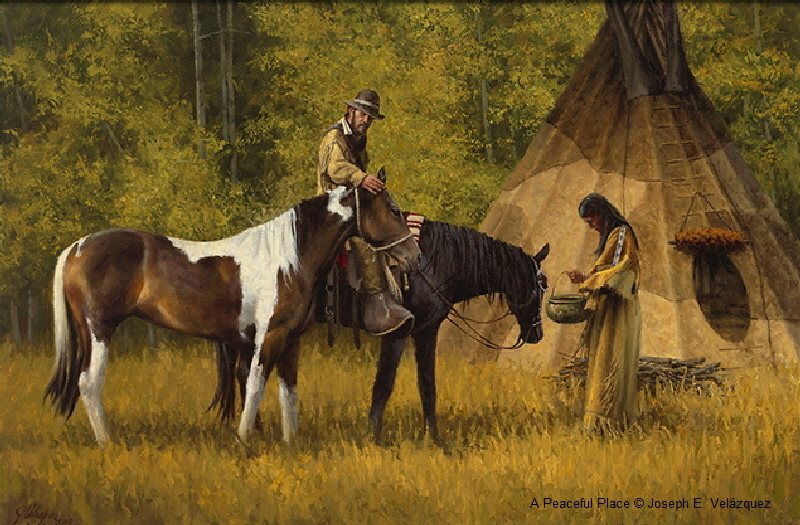 This painting depicts the camp of a white trapper and his Indian wife. The grass has turned a golden color and the aspens are beginning to display the hues of approaching autumn. The air is clean and crisp, the days warm, the nights cold. As the fall trapping season gives way to winter, they will leave the high country and descend to a warmer elevation where they will meet her tribe and join their camp. The camaraderie of her friends and family will make the long winter more pleasant. The bulk of their time will be spent making, mending and acquiring the equipment and supplies for the coming spring trapping season.